By the time of the Gupta dynasty (c. AD 320-c. 600), Buddhism in India was being affected by the revival of Brahmanic religion and the rising tide of bhakti (a devotional movement that emphasized the intense love of a devotee for a personal god). 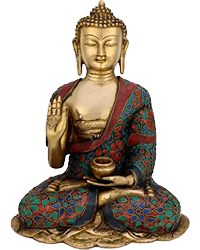 During this period, for example, some Hindus were practicing devotion to the Buddha, whom they regarded as an avatar (incarnation) of the Hindu deity Vishnu. During the Gupta period some monasteries joined together to form monastic centres (mahaviharas) that functioned as universities. The most famous of these, located at Nalanda, had a curriculum that went far beyond the bounds of traditional Buddhism. Nalanda soon became the leading centre for the study of Mahayana, which was rapidly becoming the dominant Buddhist tradition in India. Though Buddhist institutions seemed to be faring well under the Guptas, various Chinese pilgrims visiting India between AD 400 and 700 could discern an internal decline in the Buddhist community and the beginning of the reabsorption of Indian Buddhism by Hinduism. Among these pilgrims were Fa-hsien, Sung Yün, Hui-sheng, Hsüan-tsang, and I-ching. The accounts of these Chinese travelers provide invaluable information about Asian cultures from the Sasanian (Persian) empire in the west to Sumatra and Java in the east, and from Turfan in Central Asia to Kañchi in the south of India. In 399 Fa-hsien left China, crossed the Gobi (Desert), and visited various holy places in India. He then returned to China via Sri Lanka and Java, taking with him numerous Buddhist scriptures and statues. The most famous of the Chinese travelers was the 7th-century monk Hsüan-tsang. When he arrived in northwestern India, he found "millions of monasteries" reduced to ruins by the Huns, a nomadic Central Asian people. Many of the remaining Buddhists were developing their own form of Tantrism, an esoteric psychic-physical system of belief and practice. In the northeast, Hsüan-tsang visited various holy places and studied Yogacara, a Mahayana system, and Indian philosophy at Nalanda. After visiting Assam and southern India he returned to China with some 600 sutras. After the destruction of numerous Buddhist monasteries in the 6th century AD by the Huns, Buddhism revived, especially in the northeast, where it flourished for a time under the Buddhist Pala kings (8th-12th century AD). These kings continued to protect the great monastic establishments (mahaviharas), building such new centres as Odantapuri, near Nalanda, and establishing a system of supervision for all such institutions. Under the Palas, Tantric Buddhism (i.e., Vajrayana) became the dominant sect. Adepts of this sect, called siddhas, identified nirvana with the passions, maintaining that one could "touch the deathless element with his body." Though some of its practices seemed excessive, scholars of this school sought to revalorize some of the most archaic elements in Indian religion. During this period, the university of Nalanda became a centre for the study of Tantric Buddhism and the practice of Tantric magic and rituals. Under the Pala kings, contacts with China decreased as Indians began to turn their attention to Tibet and Southeast Asia. With the collapse of the Pala dynasty in the 12th century, Buddhism suffered another defeat, and this time it did not recover. Though some pockets of Buddhist influence remained, the Buddhist presence in India became so negligible that it could hardly be noticed. Scholars do not know all the factors that contributed to the demise of Buddhism in its original homeland. Some have maintained that Buddhism was so tolerant of other faiths that it was simply reabsorbed by a revitalized Hindu tradition. This did occur, although Indian Mahayanists occasionally displayed a hostile attitude toward bhakti and toward Hinduism in general. However, there was another factor that was very important as well: Buddhism in India, having become mainly a monastic movement, probably paid little heed to the laity. Some monasteries became wealthy enough to have slaves and hired labourers to care for the monks and tend the lands they owned. Thus, after the Muslim invaders sacked the Indian monasteries in the 12th century AD, Buddhists had little basis for recovery. After the destruction of the monasteries, the Buddhist laity showed little interest in restoring the "Way." At the beginning of the 20th century Buddhism was virtually extinct in India. Since the early 1900s, however, a significant Buddhist presence has been re-established. In the early decades of the 20th century a number of Buddhist societies were organized by Indian intellectuals who found in Buddhism an alternative to a Hindu tradition that they could no longer accept; an alternative that was, in addition, part of the cultural heritage of India. Following the Chinese conquest of Tibet in the late 1950s, there was an influx of Tibetan Buddhists who established a highly visible Buddhist community in northern India. In addition, the incorporation of Sikkim in 1975 into the Republic of India has brought into the modern Indian nation a small Himalayan society that has a strong Buddhist tradition related to the Vajrayana Buddhism of Tibet. The major component in the 20th-century resurgence of Buddhism in India has, however, been the mass conversion of large numbers of people from the so-called scheduled castes (formerly called Untouchables). This conversion movement, originally led by Bhimrao Ramji Ambedkar, began in the 1950s. In October 1956 Ambedkar and several hundred thousand of his followers converted to Buddhism, and--although accurate figures are difficult to determine--the group has continued to grow. Some estimates indicate that the number of converts is as high as four million. This group, which in the past has tended to favour the Theravada version of Buddhism, is developing its own distinctive patterns of Buddhist teaching and practice.